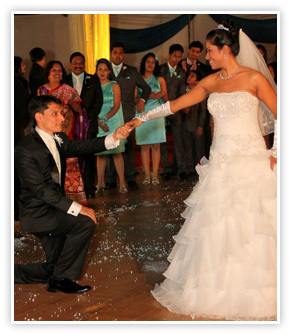 Your first dance as a couple is a special moment of joy and togetherness. It is a time when you will be on the center stage and many expectant eyes will be on you. Dance Concepts knows how to make your lessons fun and easy and will customize the dance lessons for your first dance to suit your personality and dance desires. Our specialized wedding dance programs are backed with over a decade of experience in helping couples make their first dance unique and memorable. We are with you to help you dance the first dance of your dreams. We also offer unique combination of Latin and Ballroom dance styles merging two different dances to suit your style. We endeavour to work as a team bringing in the desired perfection and partner connection so required for the most important dance of your life. Here is what our students have to say …. Copyright © All rights reserved. Website design and development by Wextar Interactive.